The Arc Baltimore’s Community Living division assists more than 280 people in homes and apartments across the Baltimore area, all with the aim of helping people become full and active members of the communities of their choosing. Supports are individually tailored and are provided on a part- or full-time basis, according to their needs and preferences. Individuals are supported so they can be as independent as possible and enjoy friends, family, hobbies, or whatever interests they may have. 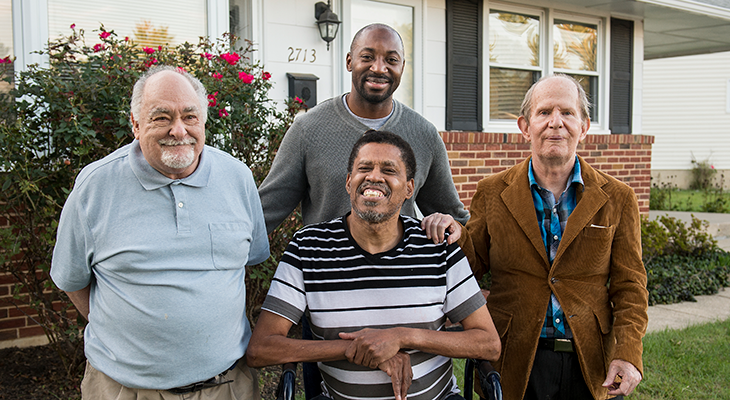 The Arc helps individuals live in the community as independently as possible with a variety of potential living situations and staffing arrangements. Live in my own place, with or without roommates: The Arc assists people who want to rent or buy their own home. If they wish to live with roommates, we help them connect with suitable roommates. The Arc provides a schedule for drop-in staff support. Live with others in an agency owned or rented home: Some people live in homes typically with two other people. They may have greater needs for supervision, so more hours of staff support are provided, some as much as 24 hour a day. Live in another person’s home and receive supports from them: Similar to adult foster care, individuals live with a support provider in their home. Supports may be 24 hours a day or may be more limited. Basic services and supports in a house are geared to provide for safety and health. Staff helps as needed with cooking, cleaning, laundry, personal hygiene, transportation, and medications, with the emphasis to encourage and teach individuals to be as independent as possible. Staff also supports people to pursue interests and friendships.